One-Up Bond F contains a unique color chromatic agent which gives the clinician visual confirmation of each step by color change. 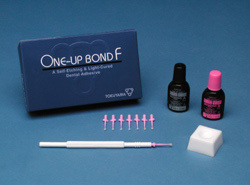 One-Up Bond F is a self-etching, light-cured, and fluoride releasing bonding agent. One-Up Bond F contains a unique color chromatic agent which gives the clinician visual confirmation of each step by color change. The chromatic agent is visible (pink) during application and invisible (clear) upon complete polymerization. One-Up Bond F contains the patented MAC-10 adhesive monomer offering strong adhesion to enamel and dentin. Tokuyama Dental America, 9 Mason, Irvine, CA 92618. Tel: 949-581-9600 ; Fax: 949-465-1095 .